A VDC can be used to virtualize the device itself, presenting the physical switch as multiple logical devices. Within that VDC it can contain its own unique and independent set of VLANs and VRFs. Each VDC can have assigned to it physical ports, thus allowing for the hardware data plane to be virtualized as well. Within each VDC, a separate management domain can manage the VDC itself, thus allowing the management plane itself to also be virtualized. 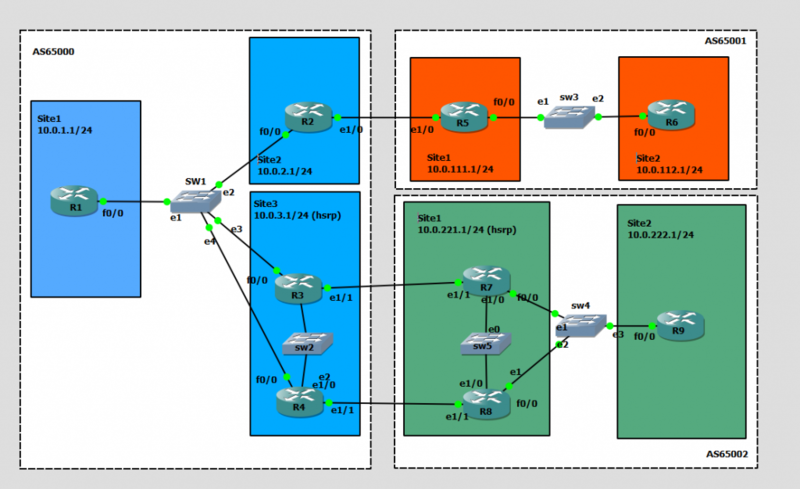 Building a case study from the ARCH FLG book; BGP communities. 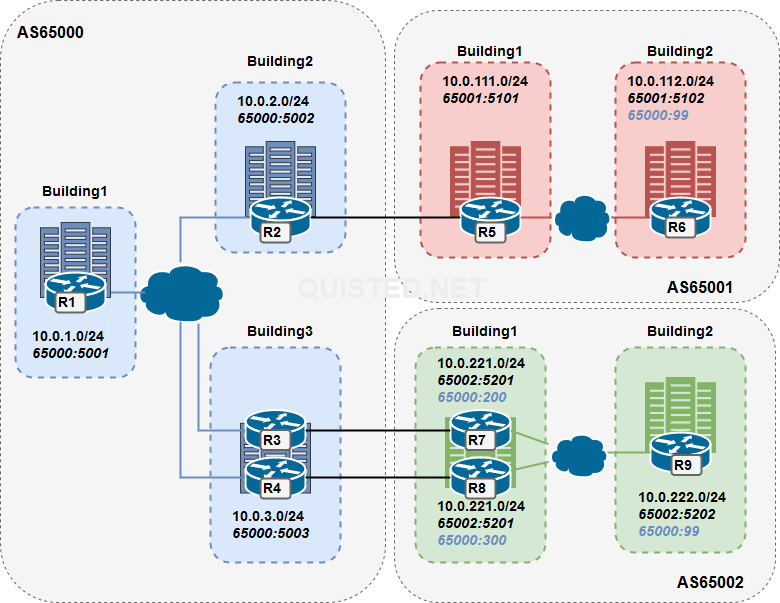 Configure communities to tag the routes per building on each AS. Configure communities as no-export so the routes of AS65001.building2 and AS65002.building2 are not exported through AS65000. The routes will be tagged on R6 and R9 with community 65000:99 and processed on the AS boundry. The routes of AS65001.building1 and AS65002.building1 are allowed to be exported. Configure communities so that R7 and R8 can set their local preference on the AS65000 side. The routes will be tagged on R7 will be tagged with 65000:200 resulting in a local-preference of 200. The routes will be tagged on R8 will be tagged with 65000:300 resulting in a local-preference of 300. What this will accomplish is that a local pref community is send to AS65000 with resulting values of 200 for R7 and 300 for R8 for the 10.0.221.0/24 route. route-map TAG-IN permit 40                  # This to allow all other routes if there were any.